A business that wants to grow and stand out from the competition must learn how to identify its niche. In this way, it’ll be easy for people to find them. Becoming known for a certain niche is one of the few ways to seek recognition for a certain expertise. On the Internet, Google offers a tool that increases your ability to be recognized for your expertise, thereby, reaching out to more potential clients. This tool is known to many as Google Authorship. It’s a tool that lets writers claim articles that they’ve written. This is also an ideal way to enable search engine in finding more articles or content of the same author. Google+ is a social media site of Google. If you’ve been receiving invitations from your friends and colleagues to join this site, then do it. It works the same way as Facebook, Twitter, and LinkedIn but with some great features that you can’t find in those social networking sites mentioned. The account you’ve created on this site is based on your profile in Google. 2. Setup your Google+ profile.. the right way. Add a recognizable & decent profile photo. You must have a profile picture included. It’s one of the requirements of this search engine giant. Make sure that the photo has a recognizable shot of you. Your name. You have to ensure that the byline in your content matches the name you’ve used in signing up for Google+. For instance, if your name on your blog is “Pauline Cab,” then your name on Google Plus profile must also be “Pauline Cab” Otherwise, otherwise it won’t work. First Option: Create an email address. You must create an email address on the same domain as your content. It’ll be used by Google to send a verification code to verify your page. So, if your domain name is abc.com, then your email address must be yourname@abc.com and not yourname@gmail.com or whatever email program you’ve chosen. When you sign up for Google Authorship button, you’ll have to enter that email address in the box. 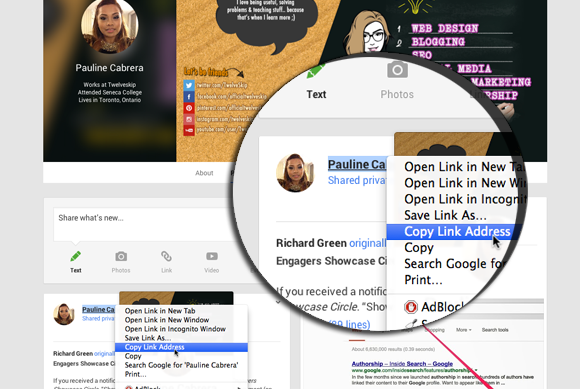 Step 1: Add your website's link to your blog. Go to About > Edit Links > Add Custom Link under the contributor. See how I have the Google+ link added with my full name on it? Once you’re done, you’ll need to wait for a few days to a few weeks for your Authorship information to appear in search results. It’s a wise idea to grab Authorship to your page template as it makes it easier for your “fans” to read the articles you’ve contributed to.